Medora: Art Destination or Bust! 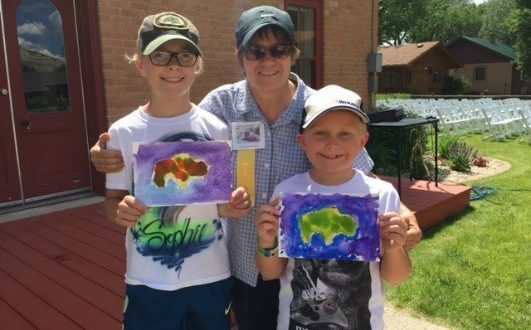 The first week of June was full of painting activities for Medora visitors. The first ever “Spur Your Inner Artist with Drawing and Watercolor” 4 -day workshop was held in the Bill and Jane Life Skills Center from June 5-8th. 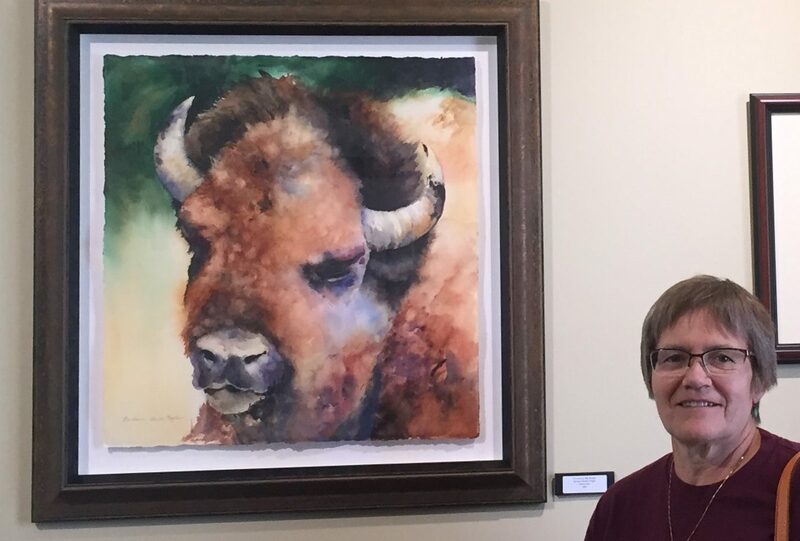 Taught by Wahpeton, ND native and visual artist/veteran teacher Barbara Benda Nagle, this class was a creative vacation for those who may benefit from the inspiration of the Badlands. Many in the class signed up for the Stay and Paint package, which included the workshop, lodging and the Medora Musical. At least half of the students classified themselves as beginner artists yet they all progressed rapidly through the process from drawing to painting. Medora, N.D. – The Von Hoffmann House in Medora, formerly the home of the Medora Doll House, has been restored and will be dedicated on Saturday, June 16. The Theodore Roosevelt Medora Foundation recently restored the Von Hoffmann House to showcase its historical significance, and it now features a collection of original furniture and period furnishings. In addition, it features a display of the Ferris family’s correspondence with their friend, Theodore Roosevelt. This project was part of the Foundation’s historic preservation and restoration initiative. The historic house was built by Medora Vallambrosa’s parents, the Baron and Mrs. Von Hoffmann in 1884 and is featured on the National Registry of Historic Places. The dedication will take place in the back yard of the Von Hoffmann House at 1 p.m. MDT on June 16. The Von Hoffmann House dedication ceremony will also include the dedication of the Founder’s Park, the Wall of Honor and the Elaine Andrist Garden. The Founder’s Park honors the individuals who were instrumental in Medora’s history and early beginnings including Harold Schafer, Theodore Roosevelt, Marquis de Mores, and the various donors to the Theodore Roosevelt Medora Foundation. Medora is located at the entrance to the South Unit of Theodore Roosevelt National Park. As North Dakota’s #1 vacation destination, Medora offers family entertainment in an Old West atmosphere. Medora, N.D. – Whether you enjoy fitness, nature, entertainment or food, Medora is the place to be the weekend of June 8-10. The 2012 season of the Medora Musical kicks off Friday, June 8 at 8:30 p.m. MDT. This professionally-produced, high energy, Western style revue is set in the Burning Hills Amphitheatre in the North Dakota Badlands. It features nightly performances through September 8. Foodies will enjoy the Pitchfork Fondue, also opening June 8 at 6:15 MDT at the Tjaden Terrace, overlooking the North Dakota Badlands. Nature lovers will enjoy free gate admission to Theodore Roosevelt National Park, courtesy of National Park Fee-Free Day. On June 9, all National Parks, including Theodore Roosevelt National Park near Medora, waive entrance fees. Tickets to the Medora Musical can be purchased by calling 1-800-MEDORA-1 or online at www.medora.com. Also available online are vacation and golf packages, and Bully Pulpit Golf Course information. Hotel reservations can be made by calling 1-800-MEDORA-1. Celebrating its 48th season in 2012, the Medora Musical is a professionally-produced, high energy, Western style revue set in the 2,852 seat Burning Hills Amphitheatre in the North Dakota Badlands. Audiences are treated to an exciting array of song and dance routines performed by the Burning Hills Singers and accompanied by the on-stage band, the Coal Diggers. This family-friendly show is dedicated to the legacy of President Theodore Roosevelt and his time spent in the Badlands. Medora, N.D. – The summer travel season kicks off with National Travel and Tourism Week, May 5-13. And this year, more adventure and fun await visitors to Medora. The Theodore Roosevelt Medora Foundation has a variety of new activities and attractions, ranging from kids’ activities and entertainment to shopping and history, in store for its summer guests. In addition to the existing family activities like mini golf, guests can enjoy the Family Fun Center. This newly-created fun center is entertainment for all ages and features the world’s largest inflatable slide, a bungee jump and rock climbing wall. And back by popular demand is the Badlands Shooting Gallery. This long-time favorite returns in its original spot, around the corner from the Old Town Hall Theater. This year’s Medora Musical spectators will be entertained not only by the talented Burning Hills Singers and Coal Diggers band, but also by variety acts ranging from a Hip Hop roller skating crew featured on NBC’s hit show “America’s Got Talent” to a popular comedian featured on CMT and an illusionist. Tickets to the Medora Musical can be purchased now by calling 1-800-MEDORA-1 or online at www.medora.com. As part of the Foundation’s historic preservation and restoration initiative, the Von Hoffmann house has been restored to showcase its historical significance. Formerly the home of the Medora Doll House, the Von Hoffmann house now features a collection of original furniture and period furnishings. Here, visitors can learn about two of Medora’s well-known families and enjoy the gallery of the Ferris family’s correspondence with their friend Theodore Roosevelt. This new shop provides a unique patriotic shopping experience. The Made in the U.S.A. Mercantile offers a wide variety of souvenir gifts made entirely in the U.S.A., including “Pride of Dakota” items. Theodore Roosevelt comes to life in this new, vivid presentation. Learn about Theodore Roosevelt as President, husband, father, soldier and hunter. Much of this new show focuses on Roosevelt’s time in the North Dakota Badlands. Roosevelt is portrayed by Joe Wiegand, who has performed this role nationally, including a White House appearance in celebration of TR’s 150th birthday.